Abuse: Non-accidental infliction of physical or psychological injury or sexual abuse by a parent, household member, or other person responsible for care of a child or vulnerable adult. Neglect: Failure/omission by a caretaker to provide the care, supervision, services or protection necessary to maintain physical and mental health. Threatened harm: A situation, circumstance or behavior which leads a prudent person to have reasonable cause to suspect abuse. Also, neglect may have already occurred or may occur in the immediate future if no intervention is provided. Mandatory reporters must give their names when giving a report, but the name will be kept confidential. In the health professions, only physicians and nurses are mandatory reporters. Chapter 39 of the Florida Statues mandates that any person who knows, or has cause to suspect, that a child is abused, neglected by a parent, legal custodian, or caregiver, or other person responsible for the child's welfare, shall immediately report such knowledge or suspicion to the Florida Abuse Hotline or the Department of Children and Families. In some states, a child's being witness to, or present during, abuse is also cause to report child abuse, but this is not true in the state of Florida. Clearly, there are negative effects on a child who witnesses abuse, but some authorities believe that this type of reporting punishes the victim who may be a good or adequate care provider for the children. However, if criminal proceedings are brought against an individual for domestic violence, and that violence was perpetrated in the presence of a child under 16 years old, who is a family household member with the victim or perpetrator, the sentencing points (calculated by a number of factors) are multiplied by 1.5. Children in Florida must be reported to the Department of Children and Families if they have been witness to domestic/intimate partner violence. Chapter 415 of the Florida Statues mandates that the Department of Children and Families also provide services to detect and correct abuse, neglect and exploitation of vulnerable adults who, because of their age or disability, may be unable to adequately provide for their own care or protection. Florida has many retirement communities and a large population of older adults, many who are vulnerable because of age and increasing disability. They may be dependent on others for care and support. Additionally, there are 60,000 people, aged 18 through 59, in Florida who have at least 3 severe deficiencies of daily living caused by disabilities. Through case management and various in-home services, many of these individuals are maintained at home or in assisted living facilities. Because they may not be able to self-report abuse, they are particularly vulnerable. Vulnerable adults include the elderly and the disabled. Florida Statute 790.24 requires any physician, nurse, or employee of a hospital, sanitarium, clinic, or nursing home treating or receiving a request for treatment must report immediately to local law enforcement any gunshot wound or life-threatening injury indicating an act of violence. Any person willfully failing to report such treatment or request therefor is guilty of a class A misdemeanor, punishable as provided in Florida Statute 775.082 or 775.083. Most injuries associated with domestic violence are less severe and not covered by 790.24. A competent individual has a right to privacy and self-determination. Therefore, in Florida a health care provider may not report domestic violence without informed consent, even if the victim admits to it. However, the victim of domestic violence should be counseled to report the incident to law enforcement and referred for guidance and support to a local Domestic Violence Advocacy organization. The health care provider should adhere to their facility policy and procedures when counseling a victim of domestic violence. Note: Reporting suspected domestic violence without informed consent is considered unethical in the state of Florida and may leave the healthcare provider who reported the violence open to civil action. If a person comes to the emergency department with a fractured arm from an episode of domestic/intimate partner violence, this incident needs to be reported to the authorities. Specific description of the incident(s), including who was involved, what occurred, when and where it occurred, why it happened, the extent of injuries, what the victim(s) reported, and any other pertinent information. If making a call and the line is busy, the reporter may have to wait for a few minutes. However, if the situation is an emergency and the victim is in imminent danger, the caller should hang up, dial 911, report a need for assistance, and then follow-up with a call to the Abuse Hotline. Mandatory reporters are required to give their names to the Abuse Hotline counselors. Reporters should document the first name of the counselor and his or her identification number and the date and time of the call. The counselor should inform the reporter if the report meets the statutory requirements for a report and whether an investigation will be initiated. The counselor will also provide information on available services. 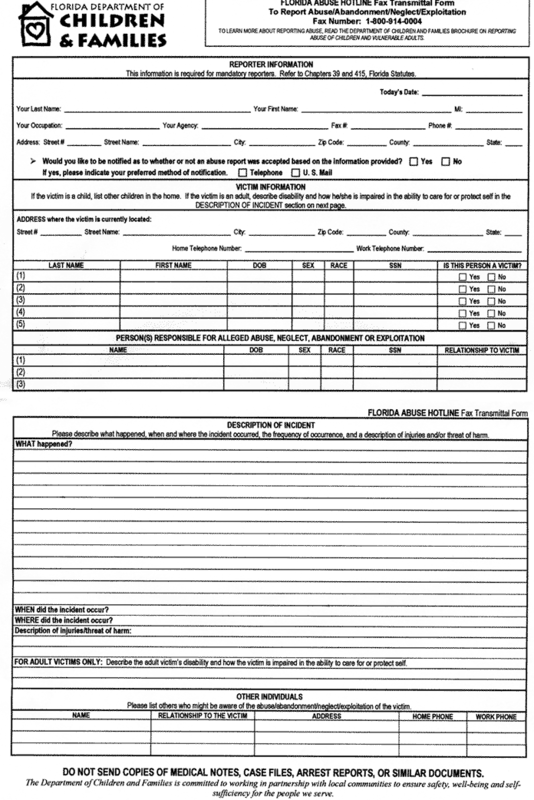 If sending a FAX, it is best to use the form provided by the Department of Children and Families. If the form is not available, the report should be as detailed as possible, including all names, addresses, telephone numbers, and pertinent information. The report should be written typed or written legibly. It should not contain profession-specific abbreviations or terminology (e.g. fx instead of fracture). No medical notes, case files, or arrest reports should be included. Since the time required to send a FAX is often longer than the time to telephone, telephone calls should be used to report all emergency or critical situations. Reporters should document the first name and identification number of the Abuse Hotline counselor. Please visit the website of Florida Department of Children and Families for more "tips" on reporting, and using the Fax form below.